While being a stay-at-home parent isn’t for everyone, many parents would prefer to be home with their children more often. For most families, working part-time work, or being a stay-at-home parent just isn’t financially feasible. Many working parents feel bad they can’t attend every baseball game or feel guilty that a daycare provider spends more waking hours with their children than they do. Taking time out of your overbooked schedule to care for yourself may seem impossible, or perhaps even counterintuitive. After all, if you feel guilty that you don’t spend enough time with your child, why should you then take time out for yourself? The truth is, the busier you are, the more important it is to care for yourself. If you’re stressed out and run down, you’ll struggle to enjoy quality time with your child. Resist the temptation to engage in unhealthy habits, like skimping on sleep or using alcohol to unwind. Commit to caring for yourself so you can make the most of the time that you have with your family. Quite often, parents assume that their work schedule creates an undue hardship for their child. A father may think, “My kids shouldn’t have to go to daycare after school every day. It’s just not fair to them.” But in reality, his children may enjoy playing with their friends after school every day. Watch out for unrealistic thoughts that could fuel your guilt. Replace those types of thoughts with something more helpful, such as, “My children enjoy spending time with friends for a few hours each day.” Keeping things in a realistic perspective can help keep unnecessary guilt at bay. Many parents also underestimate their children’s coping abilities. A mother who misses a school concert may imagine her daughter crying and feeling abandoned. Or she may think her absence from such events will scar her child for life. Underestimating your child’s ability to cope with feelings like disappointment and frustration could actually be harmful. Children need to learn to cope with discomfort and missing a few events or not being home every minute of their waking hours gives them an opportunity to practice dealing with the same emotions they’ll experience throughout the rest of their lives. Unfortunately, many parents try to make up for working long hours by spoiling their child or excusing their misbehavior. Don’t use your guilt as a reason to spoil your child. Kids need to learn healthy limits and they need effective consequences that will teach them life lessons. Pitying your child will do more harm than good. Feeling sorry for your child can lead to low expectations and little accountability – which won’t be helpful. Keep your child’s problems in perspective and remember that millions of children with working parents grow up to be healthy, responsible adults. Many working parents feel guilty when they’re working because they feel like they should be spending time with their children. But then when they do try to spend time with their children, they feel guilty that they’re not doing something more productive. Carve out time to be with your child every day and practice being present with your child. Focus on creating as much quality time together as you can. Read a story before bed, eat dinner together, or play catch every Saturday morning. Accept that you’re likely to have to give up some things in life – like having a spotless house – in order to create room for quality time with your child. But doing so, can help alleviate your guilt and help you keep your priorities straight. 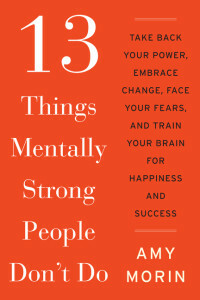 Amy Morin is the author of of 13 Things Mentally Strong People Don’t Do, a bestselling book that is being translated into more than 20 languages.